2018 has been a rough year so far for shareholders of Altria Group Inc. (MO - Get Report) . Since the calendar flipped to January, this tobacco and alcohol giant has shed more than 12% of its market value, trailing the broad market meaningfully during a choppy year when positive performance has been particularly valuable. But fixating on Altria's year-to-date performance misses a much more important trend that's been taking shape in shares of this stock over the last several months - and a buy signal that could be brewing this fall. Altria has basically undergone two major trends in 2018: The first was a well-defined downtrend that led into the summer months, and the second has actually been an uptrend that started back in the middle of May, and has remained in play ever since. So far, Altria's rough start to the year has overshadowed the progress made by its uptrend over the last six months. But that could be about to change. Altria is in make-or-break mode this fall, as shares test a key price floor this week. Simply put, how shares hold up here could dictate how this giant income stock acts for the rest of the year. You don't need to be a technical analysis expert to spot the trend currently being tested in Altria: This well-defined rally is about as straightforward as trading setups get. 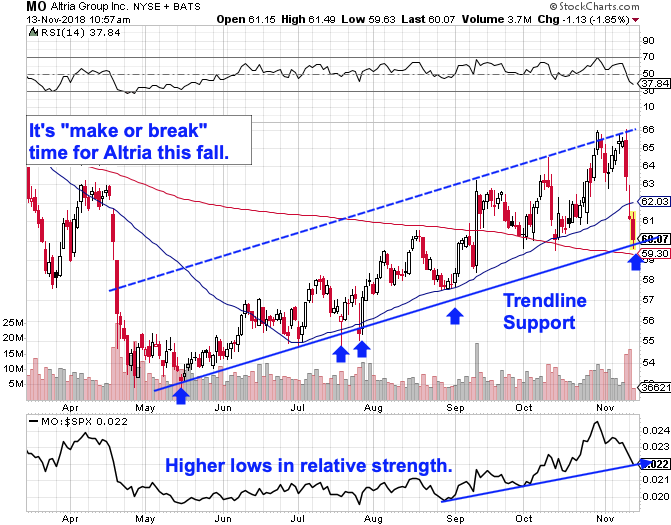 At this point, the last four tests of trendline support have provided low-risk high-reward buying opportunities for shares of Altria before a subsequent up-move. That means, if history is any indication, a fifth bounce higher here sends investors a strong buy signal for the final stretch of 2018. Relative strength, the side-indicator down at the bottom of the Altria chart, adds some extra confidence to the upside opportunity in shares right now. Relative strength kicked off an uptrend of its own back at the start of September; that's when Altria started systematically outperforming the rest of the broad market in its uptrend. It's important to take note of the fact that Altria's upside move is conditional on a bounce here. It's still entirely possible that shares violate their uptrend and wind up pointing lower from here. That's why it's wise to wait for buyers to actually step in and assert themselves with a bounce off of support before taking a position in Altria. It's tempting, but don't try and anticipate the move - reacting to a bounce is sufficient to take advantage of Altria's trend in the weeks ahead.